Attractive small antique mahogany bureau. A lovely antique mahogany bureau. We date this bureau to the early 20th century. 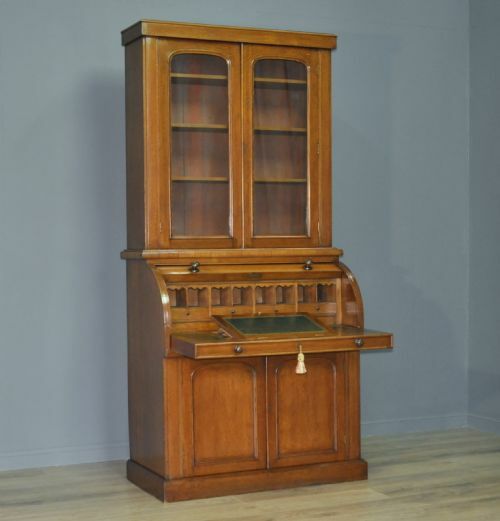 The bureau is fitted with a drop front writing slope over three long drawers. There is a further shelf to the base. The drop front is fitted with a working lock (key supplied). The drop front is supported on two chains. The chains and hooks have been replaced at some point in its life. The interior is fitted with various pigeon holes and the writing area has been covered in a red vinyl material with stud detail. The bureau has an ornate gallery to the rear and the front of the flap has a further applied scroll design in the centre. The main drawers are fitted with pairs of decorative cast drop handles each mounted on diamond shaped back plates. The bureau has an overall height of 43" (110cm), a main top surface height of 39.5" (100cm), a width of 28.5" (72cm) and an overall depth of 14" (36cm). This lovely antique mahogany bureau remains in a solid condition with surface markings commensurate with age and usage. The finish has a number of minor indentations and some minor mellowing from past use. The rear panels have a little bit of wear and there are some marks to the insides of the drawers. 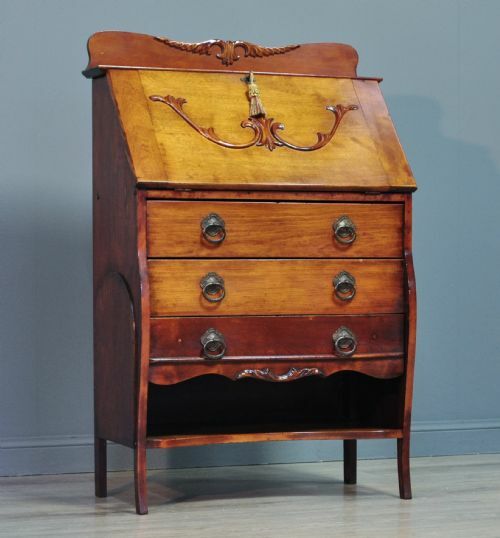 This remains a very stylish and elegant antique mahogany bureau. It will continue to provide sterling service for many years to come.